ATTRITION events Present: Oktotenfest 2013! | Crazy adventure and Insane times! Crazy adventure and Insane times! Saying something about EVERYTHING and a lot about NOTHING! 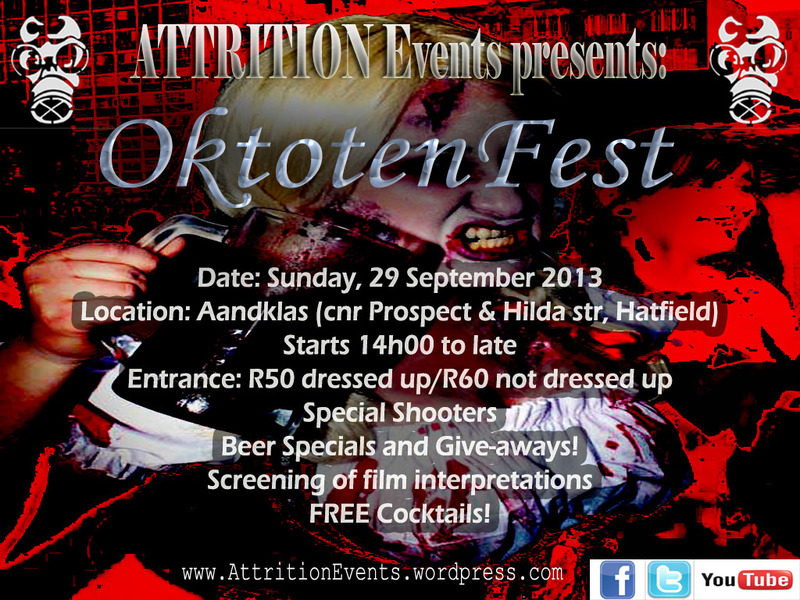 ATTRITION events Present: Oktotenfest 2013! Every year as we enter the month of October our darkest crawl out of their hovels to come and celebrate the beautiful tradition of Oktotenfest. Annually (for no apparent reason) we confuse people of non German decent into dressing up in lederhosen and to party to Oompa music. This is mostly due to the fact that we all LOVE beer, and come to celebrate the beauty that this has brought to our lives. Praising this golden liquid by consuming vast amounts of it and sharing many different brews with our dearest patrons. These events are marked with loads of beer give-aways on top of our normal cocktails, bar specials, great vibes AND due to the summer rolling in woman wearing very little! UnderWater Braai with BraaiBoy and Geko Diver!